Invasive zebra mussels have devastating economic, recreational, and environmental impacts. The first Texas infestation was found in Lake Texoma in 2009. TPWD and partners closely monitor "positive" and "suspect" lakes, as well as other lakes we consider high risk for zebra mussel introductions. State regulations require draining of water from boats and onboard receptacles when leaving or approaching public fresh waters. Infested Lakes - Fifteen Texas lakes in five river basins can be classified as fully infested with zebra mussels, meaning the water body has an established, reproducing population: Austin, Belton, Bridgeport, Canyon, Dean Gilbert (a 45-acre Community Fishing Lake in Sherman), Eagle Mountain, Georgetown, Lady Bird, Lewisville, Livingston, Randell (local Denison access only), Ray Roberts, Stillhouse Hollow, Texoma, and Travis. "Positive" Lakes - Zebra mussels or their larvae have been detected on more than one occasion in Fishing Hole Lake (a small lake connected to the Trinity River below Lake Lewisville) and lakes Grapevine, Lavon, Richland Chambers, Waco, and Worth. So far there is no evidence of a reproducing population in these lakes. River reaches downstream of infested lakes, including portions of the Colorado, Guadalupe, Lampasas, Leon, Little, Red, and Trinity rivers, are also positive for zebra mussels. "Suspect" Lakes - Zebra mussels or their larvae have been found once in recent years in lakes Dunlap, Fork, Granger, McQueeney, O.H. Ivie, Pflugerville, Ray Hubbard, and Walter E. Long. "Inconclusive" Lakes - Zebra mussel DNA or an unverified suspect organism has been found in several Texas lakes in the past year. A native of Eurasia, the zebra mussel had arrived in North America by the late 1980s, invading the Great Lakes Region. 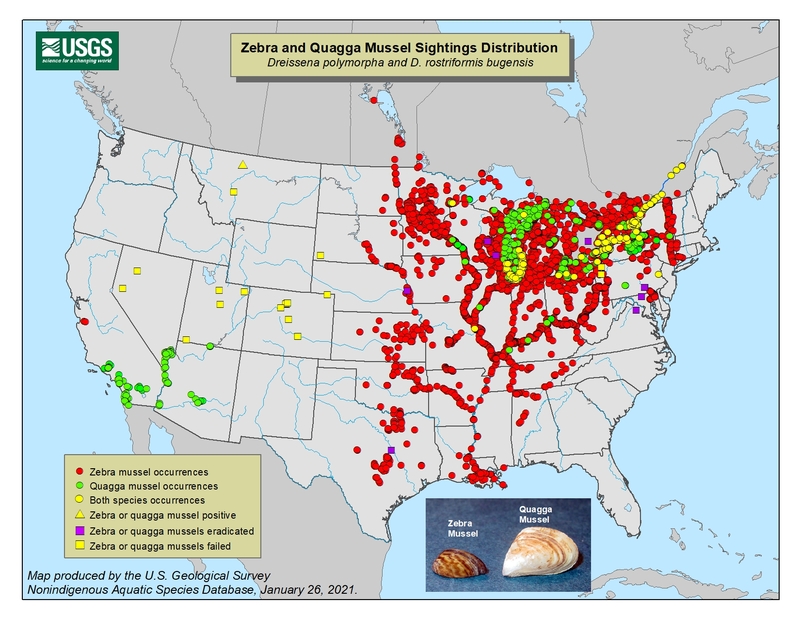 Since then the zebra mussel and its close relative the quagga mussel have spread to numerous states through the Mississippi waterway and have traveled overland on boats as far west as California.